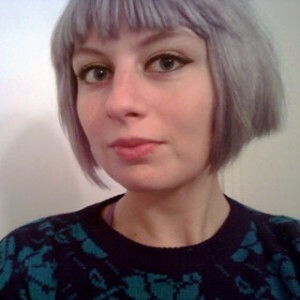 Angela Washko is a New York City based artist, who came up with an interesting idea: researching feminism and gender issues in a gaming environment. Angela choosed World of warcraft. World of Warcraft (or shortly – WoW) is the most played massive multi-player game online with about 10 millions subscribers online (altough this figure is shrinking over time). Of course Angela didn’t conduct her research on these many people, but with the aid of the players of a specific US-based server. As an in game character, Angela simply approached other players and asked them “what is feminism”? The answer was very diverse and showed how gender bias is still operating strongly in several parts of the US, cross-culturally and cross-generationally. Angela recorded her research on video and edited a really interesting series of conversation with a blood elf named Chastity.While watching these videos, always remember about the actual persons behind the toons… also remember that most female characters are portrayed by male players. This is not the case of Chastity of course. Seeing orcs, undeads, blood elves and taurens talk about gender issues might seem very odd if you add the epic music in the background, the environment of the Horde main city (Orgrimmar) and the dragons flying in and out, but all these elements make this survey even more fascinating. I contacted Angela for a few questions on her research and on gender issues in the World of Warcraft gaming community. - Gender studies about gaming communities rarely were as widely known as in 2012. I am thinking about the backlash of Anita Sarkeesian suffered during her kickstarter campaign to fund her research on gaming tropes. Yet I think you pushed this kind of research one step forward: researching within gaming communities and in gaming environment. How did you came up with this idea? I came up with this idea in 2011. As an artist, I started to feel like the most interesting contributions I could have to culture come from the unique perspective I have from my formative pursuits. I started making videos and print installations from role playing console video games that I grew up playing- as a personal effort to reveal the impact of the way women were presented on the problematic relationship issues was having. This project (“Heroines with Baggage”) got me to think about my experiences I’d had as a World of Warcraft player. The gender discrimination there was not a result of the developers- but of the community playing it. I thought – well how can I deconstruct that? And then I realized – what better way than to just ask players why it had to be that way. And so after formalizing my thoughts about it, in January of 2012 I started to log on and talk to people about it. Eventually I started to record these conversations. - Even if you studies were a form of research, I feel that your actions were a form of performance too, and a way to raise awareness. Is that the reason behind the The Council on Gender Sensitivity and Behavioral Awareness in World of Warcraft? I use the terminology “research” as a way to include people. If I tell my guildmates and other players that I’m performing (which I do if we’re talking for hours rather than minutes), it is definitely a turn-off. It feels exploitative. The relationship is established: I’m using them. If I invite them to participate in research, it establishes that what they say is valuable (which is true in either case, but it puts them in a power position over me in a way) and benefitting something greater than my own personal ego-behind-the-avatar. It is also a way to raise awareness. I am in a privileged position as a gamer (though not nearly as competitive as I used to be!) to have access to this unique social community which employs an oddly misogynistic, homophobic, and racist language despite its diversity. - What is the ultimate aim of this Council? The aim of “The Council on Gender Sensitivity and Behavioral Awareness in World of Warcraft” is two-fold. 1. I want to bring comfortable conversations about the role of women in the game, the way women are discussed (usually as WOMEN and not players), and feminism into World of Warcraft. A lot of my art practice (in and out of video games) is centered around bringing visibility to negative projections of women throughout media through play. So I hope to engage players in a way that will ultimately reveal sincere belief systems and how they were formed and not purely just responses born out of trolling. I get trolled a lot. When players troll me, I respond to them as though the answer is sincere anyway, asking follow-up questions in an effort to reveal the consistency and coherence of the problematic, coded language they (and most players) have developed. 2. I want to share my gaming world with the art world. But I want to do so responsibly, dispelling the idea that all WoW players are immature 14-16 year old boys- letting them know that players are typically near 30 and educated and are opting to use this language anyway. Participating in the art world in New York City, I forget how deeply misogynistic other parts of the US are. When I return to rural Pennsylvania or visit towns like Ocean City, Maryland I am reminded that although discussions about feminism are largely understood to be valuable by my community and the people that visit galleries where I perform or exhibit, ELSEWHERE THEY ARE NOT. And World of Warcraft takes such a large cross-section of the U.S…..I get to share that there is still much progress to be made in terms of visibility and rights. - The series of videos you posted, where you have a long conversation with a female blood elf named Chastity (I am talking about toon perception here, of course!) is quite fascinating. To your experience, what is the reaction of people not familiar with the World of Warcraft environment? Well, I wrote an essay about it because I wanted everyone to understand the context in which they are viewing it. It’s hard to get people to read, so some of the key things to understanding WoW in general get overlooked. I still constantly get the response that “IT MUST BE A BUNCH OF 14-16 YEAR OLD STUPID KIDS.” It’s totally not. The people I’ve talked are of all ages (17-60), from different social/economic/racial/gender backgrounds. Chastity is a married, pregnant 19 year old. Xentrist, also in the video, is a college student. Players that I’ve played a lot with are professors, math teachers, marines, high school students, graphic designers, severely physically handicapped people, engineers, computer programmers etc. And they still tell you to get back into the kitchen when you ask them to talk with you about feminism. 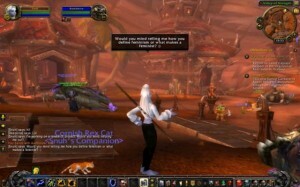 - This particular conversation takes place in Orgrimmar, capital of the Horde faction. Did your studies extend to the Alliance faction? - Have you tried this research on an RP server? Yes- an RP-PVP server (just to make clear for non-players: RP = Role Playing. On role playing servers, what you say and what you do are consistent as you truly inhabit your character, creating their personality through conversation and action…and conversations in town should be about the fantasy created- not about things happening outside the screen). You can play on a Role Playing server or a normal server (which allows language to be open to whatever and not restricted to fantasy or developing your character…in normal mode you are just a person playing the game using an avatar). I had similar results on the RP server…but many of those servers are not strict about enforcing the social language codes. But much like the question about the Horde- I prefer to do the research on servers that I have been a part of for a while. Also, I feel like doing this project on an RP server is against what I am seeking to do – I want to address the issues of common language used in the game, and it is much more of an issue on normal servers than RP servers (generally speaking). - As a non native english speaker I really need to ask you this: what is this obsession about sandwhiches?!? Is it the staple meal of gender oppression in the US? Sammies, sammiches and sandwiches. It’s a meme. It’s used to put women “in their place.” Often comes along with gb2kitchen, get back into the kitchen and make me a sammich etc. A short history on the sandwich meme here. Many memes are well loved and live large in WoW. Somehow people are still talking about Chuck Norris there. The Leeroy Jenkins meme is a very popular one created within WoW. - What is going to happen next? Chastity is the first of many long-form videos I hope to release from my performative research. It has taken a long time to sort through all the performances to find which ones really resonate somehow. Sometimes the discussions go for hours and nothing really comes out of them. I am currently at a residency in Helsinki, Finland hiding in my studio watching videos of me playing World of Warcraft. I am sure other artists find this very sad. But I really have to go through them all to figure out which ones to make into videos and release like “Chastity.” I think it is important to use the long form, and allow viewers to see the complexities of the conversations – and although I hate sitting through long video art myself, I have found that this is the only way to do it justice. I also am creating text transcripts from the conversations as well. I am performing a research discussion for a live audience at the VECTOR Festival in Toronto on Friday, February 22nd! I have done this a couple of times (Spattered Columns Gallery, Gowanus Studio Space, and Flux Factory – all in NYC). But I have a lot of processing to do with all of the documented material.